Dratzo! We return! We sit poised at last on the brink of a great victory! The energies for change on your reality have turned positive. We behold a realm that is truly in the midst of transition. Gaia asked in all earnestness that the great events on your horizon be carried out at this time. Heaven agreed with Gaia, and has decreed that this be the time in your history when your world passes from the rim of darkness to the threshold of the Light. Your political and economic systems are corrupt beyond measure and require an immitigable reshaping. These requirements are the principal aims of our Earth allies. They have stepped forward and completed a most remarkable series of reforms. A pivotal component of their package is global prosperity, as well as a universal debt forgiveness program. These elements promise that a new, more responsive form of governance can become common on your world. We have watched as each one of these respective goals were reached and readied for manifestation. Your Ascended Masters have blessed these reforms and are prepared to assist in making them see the light of day. The business of transforming your reality is not an uncomplicated task. Rather, it is filled with constant periods of interference stoked by the dark and its various henchmen. These plans, put together by the dark's minions, are filled with the underlying thought that a special sovereign relationship exists between you and the dark's selected minions. Government on your world is simply a set of agreements between the dark, its appointed cabals and governments. You are always excluded from this loop by the ruse that you were not legally allowed to participate. On the contrary, it was the illegal mendacities of the dark that long ago tricked you into the belief that somehow you did not matter. This was really the second trick. The first was the fantastic one that a fall into limited consciousness was good for you, and the only way you could maintain your reality. These lies were the basis for the previous 13 millennia of your history. Now, together, we are reversing this folly forever! Reversing these lies of the Anunnaki is the reason this first contact mission was sent here almost 20 years ago. The time approaches for you to return in joy to your fully conscious, naturally sovereign state. No longer is Heaven willing to tolerate the grand experiments of the dark. Under Heaven's direction, we came in great numbers to bring your divine abilities back into play and obtain the wisdom that you now possess. This galaxy is becoming a place of Light. Everywhere the dark once ruled with impunity now seeks the ways of the Light. This increase in the number of suitors to the Light's cause is due, in large part, to you. Your growing awareness and clear willingness to abandon the dark has raised a wondrous hue and cry throughout this galaxy. Not since the earliest moments of Anchara's decree for the Light has such an unsurpassed willingness among the dark empires been so evident. Your first tasks after metamorphosis and training will be to assist these great numbers in achieving their cherished goals. For you, this is a time of precedents. The many crucial perceptions that you hold concerning government, prosperity and your abilities are to be swiftly washed away and replaced by beliefs that seem now to be beyond your ken. What full consciousness truly is can be experienced only by participation. This is why your mentor/trainer is so important to the overall process. We cannot overemphasize this to you. When you begin your journey by traveling to Inner Earth, you will be embarking on an extraordinary adventure. Behold your new residence as the gift that is to make you whole again! The Light chamber is a living, organic vehicle that is to transform you into something special. In this new form, you will become one of us. Once your training is complete, you will know your destiny and how best to unfold it. Together, you will transform and sustain this solar system and use it as a base from which to travel to the stars and beyond, to the universe! Along the way, you will help a myriad of other Beings achieve full consciousness. Blessings! We are your Ascended Masters! We come today to discuss the great changes that are ready to be revealed to you. Our associates inform us that all is at the ready. They are waiting only for the divine right moment in which your world will alter in the twinkling of an eye. The dark's minions have run your present reality for far too long. All of us have suffered in one way or another as the dark's decrees have pushed us aside in pursuit of their own inner enjoyment. Their seemingly relentless manipulations are finally to be put to an end. Moreover, most of them will be arrested, tried and given a non-capital punishment. The world will sweep the dark aside and, in their place, put in power governance that truly uses your desires to manifest a prosperous and joyous reality. It is this new realm that will welcome Agartha and greet your space and spiritual families. It is this realm that can manifest your inner joy and allow us to freely walk among you. This new realm is not a dream! It is taking shape in all the numerous meetings that we have overseen and through the many agreements that have been legally brought about. These documents are backed by the ascendancy of Heaven and the mighty technologies of the Galactic Federation. A time has been set aside when these elements will come together and force the dark from its positions of power. We, your Ascended Masters, have joyously watched these things form and prepare to present themselves to you. This great day of transformation is at hand! The many forces of the Galactic Federation have come and shown their power in action at a few of the dark's secret bases. The dark has no other choice. It must relent and yield the reins of power to a whole host of new "caretaker" governments. Your great victory is ready to be manifest! 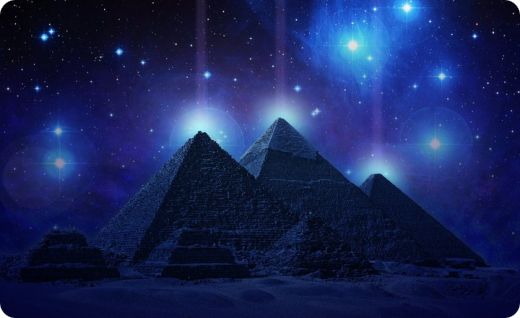 We have been preparing this rise of a new age of Light upon your world for you ever since humanity's fall from divine grace in Atlantis over 13 millennia ago. In this present time, we can all come together and celebrate an event that was prophesized by Heaven. The dark was given a moment in the divine plan to be in charge of your surface world. That time is over and Heaven decrees that the divine moment has arrived to dissolve the dark rule that plagued your realm. To accomplish this, the Galactic Federation was instructed to work closely with Gaia's Ascended Masters and provide the resources for this glorious time! This is now being divinely done. The transformation will happen suddenly. One moment of darkness will be interrupted by a vast surge of Light! Then, in an instant, the new age of Light and Love will spring forth!